I always wonder why us folks take the time to put a small scale ship into a bottle when it would be so much easier just to model a ship or craft and just plunk it on a stand and call it a day! For me I have had the fascination of this venerable craft for over a decade. I got side tracked with war gaming for over 5 years. For some strange unknown reason I would stare at Guy Demarco's book on my library shelf. Yeah one day I'll get into the hobby! Sure we all have been there right? I would sign out books at the library that dealt with modelling SIB's yet never would take the plunge. Finally a year and a half ago I made a huge decision .... I had enough of writing articles for a war gaming journal, a brief stint editing a naval war gaming journal, and basically had enough of trying to keep my blog For Honours Sake fresh and alive. I pulled the pin on all three and have never looked back. So why do I think SIB's are cool? For me they are an art form unto it's own and I dare say manly. There is something about the intregue of getting that hull and all of it's rigging into a bottle. Having been an avid model maker off and on for nearly 4 decades I thought I needed a real challenge. So I did a pile of research and the German clipper ship Preussen is my current build. I am also looking at doing some of the other P liners as well. Also a couple of rigged ironclads is a possibility. The biggest reason why I love this hobby is I can go down into my man cave and close the door and escape this messed up world for an hour or two. Sometimes I'll just go into the cave and dream of a future project and that in itself is a huge stress reliever. Am I in a rush to finish my build? No not in the least. For me the hobby is more than just trying to knock off a bunch of models. I like the research, learning about naval history, figuring out why the hull was shaped the way the architect designed it, and of course last but not least the rigging. I belive a clipper ship is a work of art and a Leviathon of the open seas. So fello modeller what is it for you? I would love to see what you put down here. What if any are the commonalities or is there something different that motivates you? What are your favourite types of vessels and what motivates you to squeeze a hull through a small hole? Great topic. I copied some of this from my profile page as I think it appropriate to put it here in this thread as well. For me, I have been interested in Ships In Bottles ever since I, as a young child, accompanied my father to the Idaho State Capital building somewhere around 1960. In one of the rooms, there was a display with many ships in bottles. Some were small and some were surprisingly large. I marveled at what it would take to build a ship in a bottle. It was not until the early 1980's, while viewing a wooden ships kit catalog from Model Expo that I saw a book by Peter Thorne about how to build a ship in a bottle. Needless to say, I purchase the book and it lead me to the wonder hobby of building ships in bottles. A few reasons why I love this hobby are, I feel the finished product is very unique and beautiful, it causes the viewers to ponder and contemplate how it is done, the fact that once our models are safely bottled they stay dust free and clean, and of course the challenge. It seems that once the nautical lifestyle is in your blood, it never leaves. Once we get our sea legs, we yearn for the ocean blue. Some very interesting points you have made especially about seeing the bottled ships when you were young. I am impressed that the experience of seeing the models in bottles when you were young has continued to inspire you and that you have stuck it out all these years. Also you are right in stating the bonus of the bottle is keeping the dust off. It's interesting that you bring up Model Expo. I purchased a 1/96 scale kit of the USS Constitution from them in 1990 and built it with a full set of sails less stunsils. After I built the beast it stayed on the mantle of our fireplace till 2013. I got tired of dusting it and donated it to our local library. Another reason why I like SIB's they take less space to store. I'm with you on the static displayed models. I had one, It was the first I had built (from Model Expo too) call the Harvey. They were running a special on these at the time. Anyway I finished mine in the mid 1980's and it is still without a case on it, and the dusting is an annual thing anymore. Ships in bottles have so much going for them. They are smaller, the dust issue, aesthetically pleasing, and they are a hoot to build. They are fairly easy to take with us as we travel about, as pointed out by DSiemens in his build log post. Like you I got started young. A girl I knew gave me "Whittling and Woodcarving" by Tangerman when I was 12 and there was a ribbon in the chapter on ships in bottles. Somehow a good ship in bottle has the permanence and dignity of a finished ship model with the freshness and spontaneity of a watercolor or sketch. Last summer I met a man who'd been at it for over 50 years. He was 91 and had seen his first ship in bottle in Germany during the Second World War. His son showed me his basement workshop where he had produced hundreds of bottled models. I'd brought a model of my own, sort of to prove my genuine interest. The old man was polite and said kind things about the model, but I could tell it was the bottle he really admired, and his own dreams of what he might have put in it. That is one awesome experience to meet a modeler with over 50 years of S.I.B. model making experience. Did he have any words of wisdom for you? For me it started with pirates. I've always enjoyed the Pirate of the Caribbean movies but the ship's in bottles in the fourth one really stuck out to me. Given they were mostly cgi because they were tossing with the waves in the bottles but, they intrigued me. I looked up how to put ships in bottles on line but it wasn't enough I had to try it. At the time I had just moved out of state and I was incredibly broke. I didn't have the money to buy a kit or even supplies so the though stuck in my mind for a while. Eventually a light bulb in my apartment burned out and looking at it I decided I had to try it. 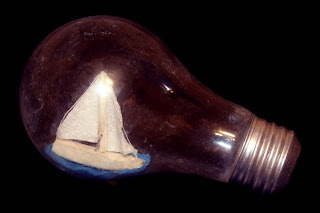 I cleaned it out and finding a stick outside, some tissue paper and some wire I built my first ship in bottle (the sea I added later). I still have it as a reminder of how far I've come. From then on I was hooked. I find sailing ships to be absolutely beautiful. Some how ships in bottles seems to catch the spirit of adventure and romanticism that is attributed to old sailing vessels. I don't know if it's the the seeming impossibility of it or the slightly distorted glass that makes it appear as if you looking into a dream but there's something magical about ships in bottles that just keeps you building. That ship is also why I always tell people your first sib can't be worse than mine. I don't know if it's the the seeming impossibility of it or the slightly distorted glass that makes it appear as if you looking into a dream but there's something magical about ships in bottles that just keeps you building. Something magical that keeps us building, and we all start at the bottom and our skill increases as we continue to build! What interesting stories! Mine is basically one that started really as a method of sellling artwork. I was a graphic designer and draftsman for years, but was always fascinated by a ship under full sail, always considered it THE one man made object that seemed alive to me. I spent years drawing pen and ink sketches of ships on my own time, building simple plastic and wood kit models as "models" to work from. Spent years where all summer long I went to art and craft shows, selling framed prints and commissioned sketches of sailing vessels of all types. I took a few of my kit models to one show, and found they sold better than the prints and sketches. Started building scratch models of sailing vessels to sell, but it took a very long time to make a decent model, so the cost was high. One day my wife came home from a visit to the library with a book on ships in bottles, telling me here was a way I could make models without taking forever, and therefore could possibly actually sell some. Little did I, or she, know just what would happen! <G> It was so long ago that this happened, that I really don't recall which book she brought home that day. I built a few traditional models, simple boats with clay/putty seas. I was sadly disappointed though in the sea materials, just didn't look right to me, and had extreme difficulty keeping the model "stuck" in the sea while pulling my control rigging lines. And the whole idea of building just generic ship types, and not terribly accurate at that, got to me after a while. Started looking for any books on ships in bottles, or any ship modeling, at our local library. Saw that there were alternative methods, so started exploring those. Then I found both McNarry's and McCaffrey's books on miniature static display models. The details they were able to create at such small scales amazed me. I started thinking that there should be no reason that one could not put such details into a ship in bottle model. Instead of being just a craft, not to speak poorly of craft models in general, why could not ships in bottles be every bit as detailed and accurate as static display models? Well, I was on my way, and no looking back! I early learned to make up several hulls and extra spars as I worked on any given model, giving me back up in case something disasterous happened to the main model. After a while, it turned out that all 3 models made it to completion. That started me working on making my methods as reproducible as possible, i.e. finding ways of making many more than single parts and pieces that were close to being exact copies. Once I had some basic detailing and rigging ideas worked out, I then became obssessed with getting ever more accurate and detailed in my vessel portrayals. I then started winning awards at model competitions, which brought me to the attention of the publisher of Model Ship Builder Magazine. At his suggestion I started writing articles on how I build ship in bottle models, which were published in that magazine for a number of years. All of which started to make me think that perhaps it is possible to build ship in bottle/ bulb models that are every bit as accurate and detailed as any similarly scaled static display model. All of this despite the limitations imposed by having to build a model that also either broke part into many pieces, or was built so as to allow breaking down, to fit through the neck of the container. I wish he had. He did have a pleasant easy going manner and still, at 91, had steady hands. He is, by the way, Antone Mantez, and you will find him on Greg Alvey's list of artists. His son got in touch with a Boston museum about a donation and they asked me to check the situation out. Antone's in a nursing home now and, according to his son, has good days and bad. I think I got a good one. I love hearing these stories of what was the inspiration, or introduction to our obsession with Ships In Bottles! That is one cool story. I too have delved into pen and ink drawings a bit but mostly illustration stuff for war gaming journals and articles. I love the fact that your wife encouraged you to build a SIB for some extra dough. What a great lady you have! BTW your models have encouraged me to do the super detail work as well as McNarry and McCaffrey. Alex ... Thanks for letting us know it was Antone Mantez. I will look him up on Greg's site. Thanks! I was working for a state agency that put out many reports each year, and being responsible for setup and printing of same, was requested to do some sketches for covers. That's how that end of things got started. I do indeed have a great lady!! Been married to her for over 42 years, and she worked full time to support us for the past 34 of those! I always consider myself one of the luckiest people alive, I have the opportunity to do what I absolutely love and the support of a wife who understands my passion. Who could ask for anything more? I am so glad to hear that my detail work has inspired you!! One thing I've found over the years is that often things I did not think were possible to do, were if you just kept trying. I always hoped that by showing what can be done, much like my inspirations from McNarry and McCaffrey, other would see it's possible to do more than one might expect. I got hooked as a kid of seven when i saw my first ship in a bottle on the mantel at a playmates house. Story was that his grandfather had made it, but nobody knew how. It was a pretty typical sailor model of a three master under bare poles floating in a sea of greenish colored putty inside an old fashioned corked whiskey bottle. I wasn't allowed to touch the thing, so i just gazed at it; trying to figure out how it was done. My mother's people were seafaring, so i'd been raised on tales about what this one or that one had seen or done, but no mention of any of them putting ships in bottles. I asked my mother whether she knew how ships were bottled, but all she could tell me was that it was a secret among sailors, though she suspected they used long tweezers or something and assembled the things inside the bottle by way of the neck. This was 1957 in a suburb just outside of Philadelphia, and there simply wasn't much information floating around about the ships in bottles. All i knew was that i wanted to make one, so i set about it with crude tweezers made from coathanger wire and an empty King's Wine bottle i'd found in a vacant lot. Ralph Preston has done amazing things building inside the bottle with what he calls the New Method, but my results were indifferent. At seven i was content enough with the two models i managed to make; they looked something like ships, and i'd even glued sails to the yards to inhance the effect. Trying to assemble the things inside their bottles with crude tools was frustrating in the extreme though, and i doubt i'd have continued if good fortune hadn't intervened. In the summer of 1957 my family took a trip to Newport, Rhode Island to visit with my mother's family. To get me out from under foot while the women visited, my mother sat me at the kitchen table across from her grandfather, who was also under foot, and told him that i was interested in ships in bottles. The old guy made short work of explaining how ships were bottled. He told me they worked like puppets, and were assembled with thread running through tiny holes drilled with a needle. He fetched out a cigar box full of little whittled bits of wood, and i figured we were off and running. We weren't. The old guy had sailed for years under British papers, mostly out of Glasgow. He didn't smoke or drink, and passed his leisure time aboard ship whittling these little square sticks about one and a half inches long and a quarter inch square, with pyramidal points. He had this knack of connecting them together without glue, and assembled them into things, like picture frames. He claimed to have invented the process, and was intent upon teaching me the method so that the secret of his invention wouldn't die out. I kept trying to get him back onto ships in bottles, but it was pretty obvious that he thought little of them as a branch of the nautical arts. Still and all, he did teach me the basic secret of how a ship is bottled, and for that i'm deeply grateful. Excellent story TJ. I was born in 57. So that's quit interesting that you were thinking about it at such a young age. Your the first one to bring up Ralph Preston. I have hit his website and looked at most of it and read what I could about his techniques. His models look good! The square stick story sounds fascinating. I never heard of anyone doing something like that! It's interesting how the men and women would talk separately when visiting AKA keep the kids and men from under foot. I haven't heard that term in decades. You have probably seen quit a few changes in techniques, materials and tools during the years I am assuming? Thanks for sharing your story. I'd guess that for most of the older bottlers, the thing that's changed the most is how we communicate, or perhaps that we communicate at all. Snail-mail newsletters, blogs, and news groups have created a bottling community that shares information and combines skills and intelligence to develop techniques. Bottling would still go on without the growth of communicarion, and there'd be guys like Ralph Preston who are perfectly capable of inventing and mastering new methods entirely on their own, but most of us i suspect benefit by sharing information. member who i happened to meet in person showed me the advantages of rigging with fly line. Seeing the work of Artem Popov and John Fox III online taught me to push the envelope with detail, and following the work of Michel Bardet opened my eyes to the possibility of beauty in a model, whatever it's level of complexity. As a community we share, we increase in proficiency, and we recruit. Bottling probably isn't going to take over the world and replace the X-Box or anything, but i don't think think that it's the dying art i'd have sworn it was thirty years ago. I do sometimes worry that through mass communication we will all tend to become homogenized. There's a perfectly human tendency to think that one's methods are the best methods and to promote, rather than simply explain, those methods. Going forward we always need to remember that in bottling there are no right or wrong ways of doing things, just individual methods, and all are worthy. I had been working on SiBs pretty much in a vacuum since buying Jack Needham's book in the late seventies and expanding on the lessons learned from him. It never occurred to me to search for other builders on the web until a little less than three years ago when I posted a project on Model Ship World. There I met Daniel Siemens who pointed me towards the Facebook and Yahoo SIBAA groups. I was also introduced to the miniature works of Donald McNarry and Lloyd McCaffery by someone who commented on my build log on MSW. The work of those two men, as it did with John Fox, inspired me to attempt that quality of detail in my own work. In the time since discovering there were other people interested in building SiBs, I have improved my work greatly - not just incrementally, but more like an order of magnitude improvement. I've learned more in a little less than three years from the MSW conventional ship model and from the SiB communities than I did in the preceding thirty-five. I agree with you 100%. I too have learned so much more from the online community, John Fox III, and the books from Lloyd McCaffery and Donald McNary. For me, these teachers, along with others, have have shown me what is possible (or rather that anything is possible), where as before I was in the vacuum too. For me, SIBs was always something that I thought was neat and that I would do as one of those bucket list kinda things. When I started getting into ship modeling, I bought the zu Mondfeld and McNarry books which piqued my interest a little more. I soon bought the Amati Hannah SIB on eBay for a great price, and thought that would be the beginning and end of my SIB career. Two points for Daniel! Welcome to BSB. We are glad you are here! Oh goodness. Well thanks... I'm sure it had more to do with the links I shared then anything. That and it's an addicting hobby. Once you get a taste for the magic that is putting a ship in bottle you just have to do it again. When I was a boy I started doing the plastic ship and aeroplane kits. I always made a real effort to get the colours correct in the camouflage etc. After a while I would make small boats and lorries (trucks) out of bits of wood. I would give them away to the younger kids who thought that they were cool. Whilst on holiday in Poole in Dorset, England, I saw a man selling ships in bottles for what I thought was a ridiculous price. The ships were not that good and I thought I could make a better model myself. However I had no idea how the ships got in the bottle. On returning home I went to the local library and got a couple of books on the subject. After a couple of attempts at which I ended with wrecks in bottles I finally managed a decent example. I just went on from there and have been doing it ever since. I don´t think I was ever truly good at it until I got a computer about 10 years ago and started seeing what others were producing. Since then I have upped my game and my ships are getting better. Thanks to some of the lads on here there has been a marked improvement. I still cannot produce satisfactory sails though!!!!!! As you peruse this site you'll discover techniques and ideas about sails. Keep on trying and... remember if you don't make a few mistakes along the way you'll never learn.